These blondies are like eating chocolate chip cookie dough…in blondie form. Oh, and did I mention they’re actually healthy? 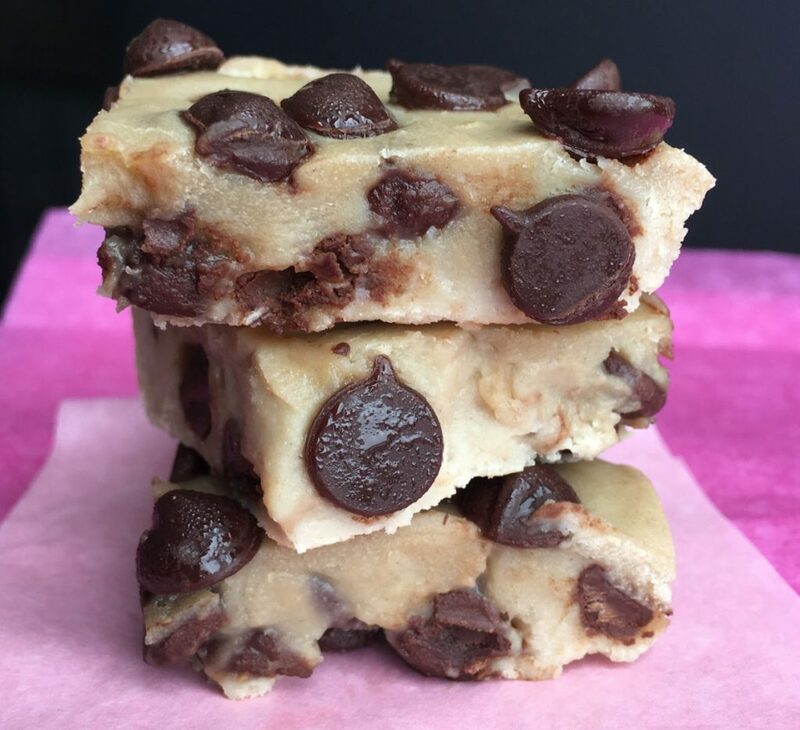 Thanks to a special secret ingredient, these chocolate chip blondies are packed full of protein and fiber, yet have the decadent taste and texture of cookie dough. They are only 100 calories with 5 grams of fat, 10 grams of carbs, and 5 grams of protein each + only 4 grams of sugar, and 3 grams of fiber! For a complete step-by-step tutorial, watch my YouTube video here. Consider this a SNEAK PEAK inside the new Healthy Brownie Cookbook, an eBook full of healthy, low-calorie blondie and brownie recipes. I had fun experimenting with beans in this recipe, but don’t worry, there are tons of recipes in the eBook that do NOT contain beans. For a complete step-by-step tutorial, watch my latest YouTube video here. Enjoy! Post a photo on Instagram, tag me @sarahlynnfitness, and use #baketobefit if you try this recipe. 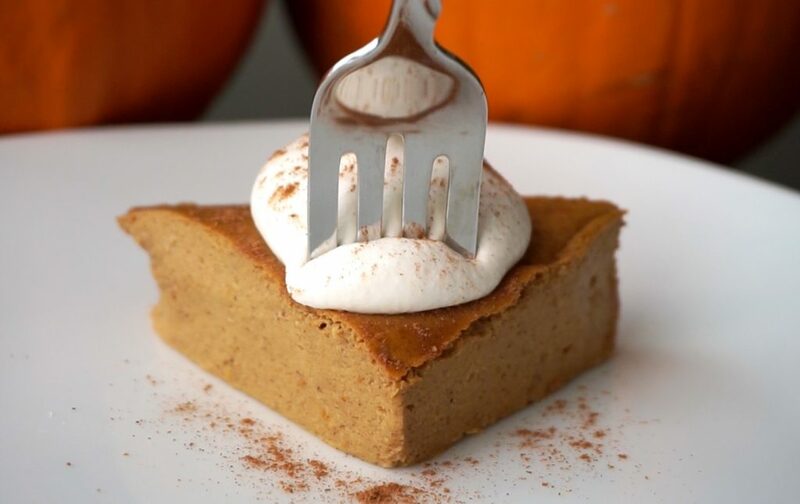 This pumpkin pie is the perfect healthy dessert to bring to your Thanksgiving gathering. Actually, after you make it, you might decide you want to keep it all for yourself. It’s gluten-free, fat-free, refined sugar-free, and high-protein, yet still has all of the flavor and texture of the traditional fall dessert. You can also enjoy this recipe any time of year – I’m a member of #TeamPumpkinYearRound! Watch my video on YouTube here for a step-by-step tutorial! Add all ingredients to a large bowl and beat until smooth. Pour into a greased 9-inch round pie pan, or into a pre-made gluten-free crust if desired. Bake at 375 for 35-40 minutes. Allow to cool completely and then refrigerate for at least 6 hours or overnight before slicing. These gluten-free, low-calorie cupcakes are filled with egg-less cookie dough. I made these for a recipe video with Business INSIDER – watch it here! Each cupcake is 102 calories with 3.5g of fat, 11g of carbs, 6g of protein, and only 4g of sugar! Combine all dry ingredients in a large bowl. Add wet ingredients and beat just until combined. Fold in sprinkles. Bake in a greased muffin tin at 350 F for 17-20 minutes. 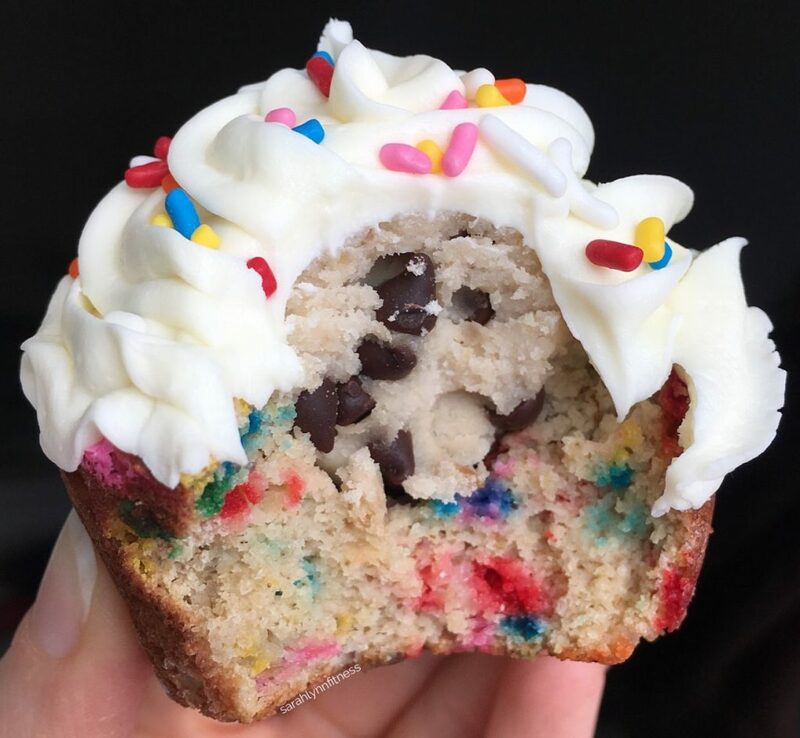 Allow to cool, and scoop out a hole in each cupcake for the cookie dough. This recipe, along with some lower calorie cookie dough filling options, are included in The Healthy Brownie Cookbook! This delicious chocolate frosting is only 28 calories 1 F / 2 C / 3 P per serving. The perfect topping for any healthy dessert recipe, or even as a spread on toast. Watch me make it step-by-step in my latest YouTube video here. 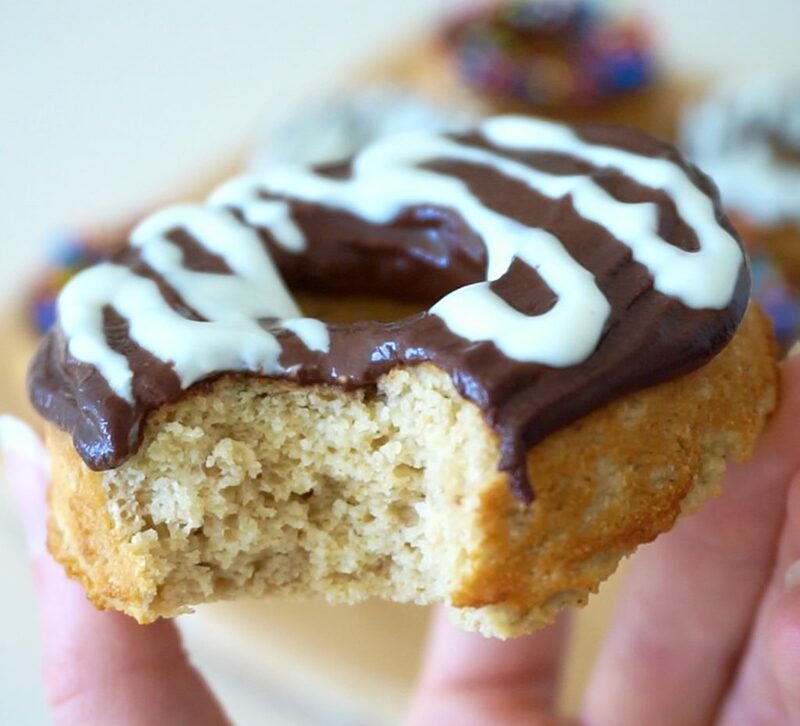 The video also shows how I decorated these healthy vanilla cake donuts. 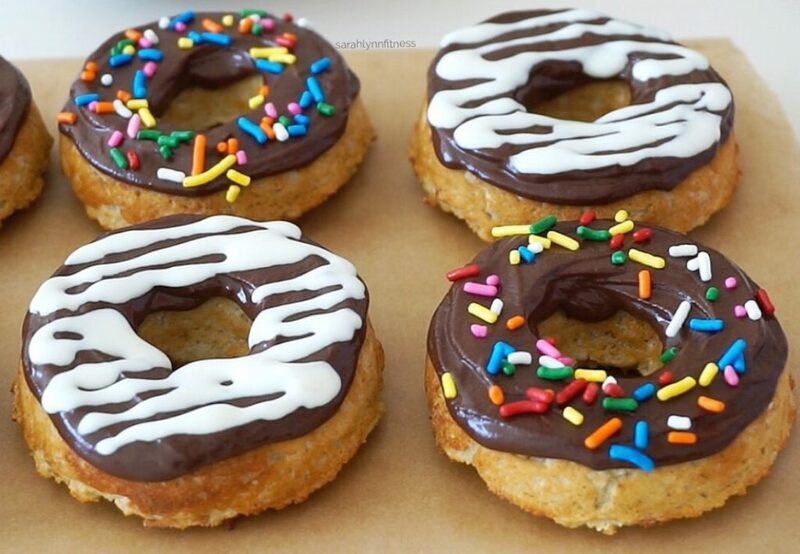 The donut recipe is available in the eBook, The Healthy Donut Cookbook! Dissolve protein powder in almond milk. Add stevia and maple syrup and stir until combined. Add cream cheese and stir until a thick frosting texture is achieved. To make the cream cheese drizzle, combine 1 tablespoon cream cheese, 1 teaspoon stevia, and 1/2 teaspoon almond milk. Check out my latest YouTube video to follow along step-by-step! 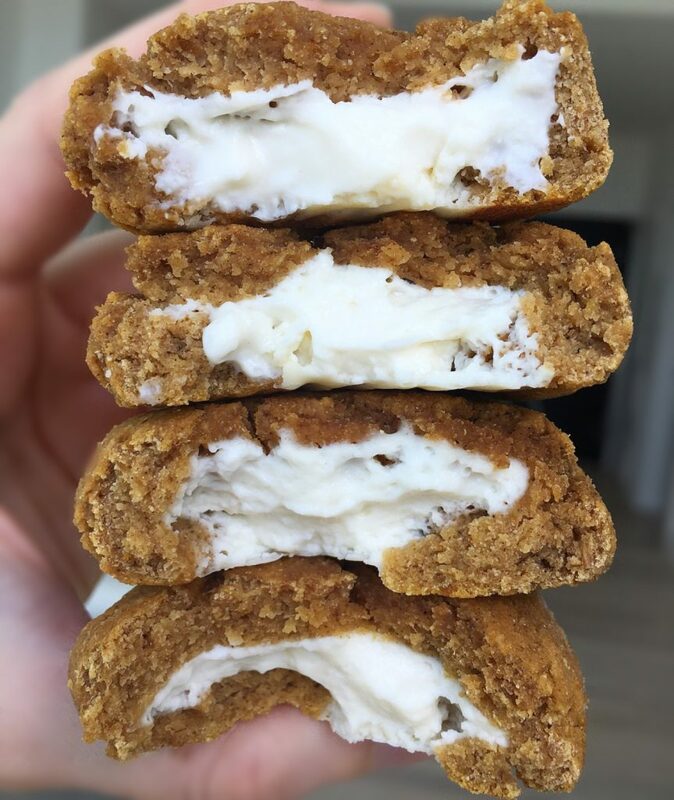 Pumpkin spice CHEESECAKE FILLED cookies. The ULTIMATE fall dessert recipe – plus, each cookie is just 85 calories with 3g fat, 10g carbs, 5g protein – and only 3g of sugar! Gluten free, refined-sugar free, high protein, and can easily be made vegan with simple substitutions. Bonus: I show how to make them step-by-step in a YouTube video which you can check out here! Mix all dry ingredients in a large bowl. Add wet ingredients and stir until dough forms. Form in 9 balls and flatten. Mix cheesecake filling ingredients in a small bowl, and top each cookie with a dollop of the mixture. Fold the cookies around the filling, and place on a parchment lined baking sheet. Bake at 350 F for 10-15 minutes. For complete step-by-step instructions, watch my YouTube video! Enjoy! Post a photo on Instagram, tag me @sarahlynnfitness and use #baketobefit if you try them.